We're driving a long way today. We're leaving southeast Ukraine heading west, crossing into, through and out of Moldova and, just a short distance over the border we reach the historical Romanian city of Iași, in the heart of the former region of Moldavia. The city was burned to the ground three times - THREE TIMES! - by invaders between 1513 and 1686. Nowadays it is an important economical hub with health care, education, tourism, technology and culture among its core sectors. In fact, Iași has long been feted as one of the leading centres of Romanian social, cultural, academic and artistic life. So it makes sense that we should stop off here and look for our next act. And I've found them, a band with perhaps the most intriguing name of our tour so far - Fine, It's Pink. Ambient electropop? Dream pop? Post-indie? All adjectives that Fine, It's Pink have scattered about their Bandcamp and Soundcloud pages. They do remind me of several things, but nothing I can quite put my finger on. I suppose that's a positive as they clearly have something different about them. They've self-released two or three singles as well as last year's 'Young Burns' EP which features the track Kids. Also, here's a video of the band performing a live cover of Landfill by London folkies Daughter. Back in the car we go, and we're southbound, through Romania, through Bulgaria and into Greece. 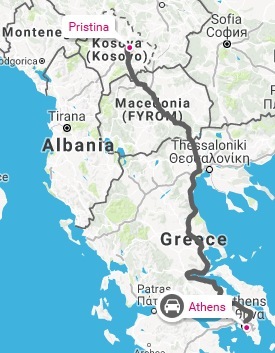 Right down in the south, where it's by far the warmest place we've been for quite some time, we arrive in the capital Athens, the second city of that name we've visited. But this one's been around for some considerable amount of time longer. I've found a band from Athens I'm quite excited about. Lower Cut have released two EPs (that you can grab for free from their Bandcamp page) and an excellent debut album. That latter release came out in 2014, but this year they returned with a rollicking new single. Among the descriptive tags on their Bandcamp page are 'dream rock' and 'postgaze'. Make of that what you will, but I strongly recommend you listen to these songs. The video is for the recent single, the MP3 is a highlight from the album. We finish this week's leg in a country that is only partially-recognised as an independent state, a place that has seen its fair share of troubles in recent years. Kosovo is still claimed by Serbia, and many countries support this claim. Nonetheless, it has its own flag, its own parliament, its own president and, since 2015, its own official national football team. Kosovo is about half the size of Wales, making it one of the world's smallest nations. It is also one of Europe's poorest with high unemployment, still not having fully recovered from the war in 1998-99. The music scene is Kosovo is small and there aren't many venues for bands to play. However, there are rock bands and one of them takes inspiration from some of the biggest bands in Britain. The Glasses cite the Beatles, the Rolling Stones and Arctic Monkeys among their main influences, as well as Jack White, The Strokes and Black Rebel Motorcycle Club. On first listen, I definitely heard early Arctic Monkeys in them, but there are other things creeping into their sound. Here's a couple of tracks from their debut album. Central Europe beckons. Dirk and Walter are awaiting our arrival. Get the kettle on, chaps. When in Rome, do as the Romans, mate ... in other words: there'll be no kettle waiting for you, instead we'll place a crate of German beer on the terrace, so that it has the correct drinking temperature when you arrive! What Dirk read is the absolute truth. I had a friend who was stationed there through the Peace Corps after college. Two truths at odds with one another: Everything is cooked in lard and all the women look like models. Great trip again, Robster. Especially like Fine, It's Pink. Lower Cut - what a discovery. Cheers Robster. The new choice of player/downloader rather disappointingly is not accompanied by the chance to download all sorts of interesting videos of naked people. It does play the track immediately on opening the tab, but that's no drawback. PixelDrain seems a winner, Robster. At the risk of sounding like Victor Kiam, I like it so much I've signed up and have just used it for the first time over at my place. Will let you know what feedback (if any) I get. Jez.